Tuesday, I wrote about the possibility of using hydrogen as a fuel, and I tried to explain things in terms a motivated student in seventh or eighth might understand. I admit, it was probably hard to follow all the way through, but if you went to the "Bottom Line" at the end of that post, I think my point was clear enough. The project I'm suggesting involves how people might--or might not--be able to use hydrogen as clean fuel someday. I'm going to teach you how to actually make hydrogen gas safely. You can use this demonstration to support your argument that hydrogen is the fuel of the future--or you can use it to support your argument that hydrogen is a really great gas, but is unlikely to amount to much. Which position you take depends on what you think! OK, for starters, read my earlier post on hydrogen fuel. Decide what you think, and state your position clearly: HYDROGEN: FUEL OF THE FUTURE or HYDROGEN, A HUGE WASTE OF MONEY, or even "HYDROGEN: FUTURE FUEL OR WASTE OF MONEY? It's up to you! As you explain your thinking, remember: a little bit of data goes a long way to support an argument. In science, especially, it's not enough to say, "I believe it, so it's true!" But do yourself a favour, and don't use me as the source of your great data. It's not that the Green Light Dhaba is unreliable; we are very reliable. But, think about it--who is your teacher going to find more trustworthy--an on-line dhaba or a magazine with a name like New Scientist or Popular Mechanics? Don't worry, follow the links provided and cite those as your sources--it won't hurt my feelings! One more thing--use personal, local examples. True stories from your own life can provide effective support to your argument. And personal connections should not be too hard to make regarding hydrogen. Remember: hydrogen is a gas; CNG is a gas...LPG is a gas! Will our autos run on hydrogen some day? Will we cook with it? 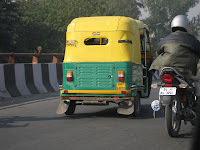 Cut out a photo of a cooking cylinder or a CNG powered bus or one of Delhi's green and yellow autorickshaws--you can find one every day or two in most Delhi papers. If you don't live in Delhi, you can use the one on the right I took a few months back--don't worry, you have my permission! Now for the real exciting bit. Watch this video and learn how to safely make hydrogen gas. If you work at it, you might even be able to fill a balloon with hydrogen gas, though this video does not show that. The great thing about a hydrogen-filled balloon is that hydrogen is lighter than air, so it will float and this might get you high marks and the respect of your classmates. However, beware! Hydrogen will burn, which is why we don't use it in lighter than air flying machines--remember the Hindenburg? Maybe it's better to stick with just making bubbles. Now remember that this demonstration proves that hydrogen is not so hard to make--but it also shows that you need to use energy to get hydrogen from water! There are, by the way, plenty of scams out there that purport to show how you can run an automobile on water and other such things. This site bursts some of those myths and is worth taking a look at. This demonstration can be used to argue several different points--and your teacher will like it because it's "hands on." Remember to bring an extra cell to school on the day you present it. How embarrassing to run out of fuel! Now you are ready to impress your teacher and your friends. If you have more summer holiday homework questions, feel free to write the Green Light Dhaba any time: you can post a comment, or write us here. But I need a few days to reply; don't expect me to rescue you at the last minute! I just reviewed your whole homework project that is much more creative and interesting. I believe that this can work in a great way if it is successfully developed or made. Lakeview Blinds Awnings Shutters boasts an impressive range of window solutions and blind services.